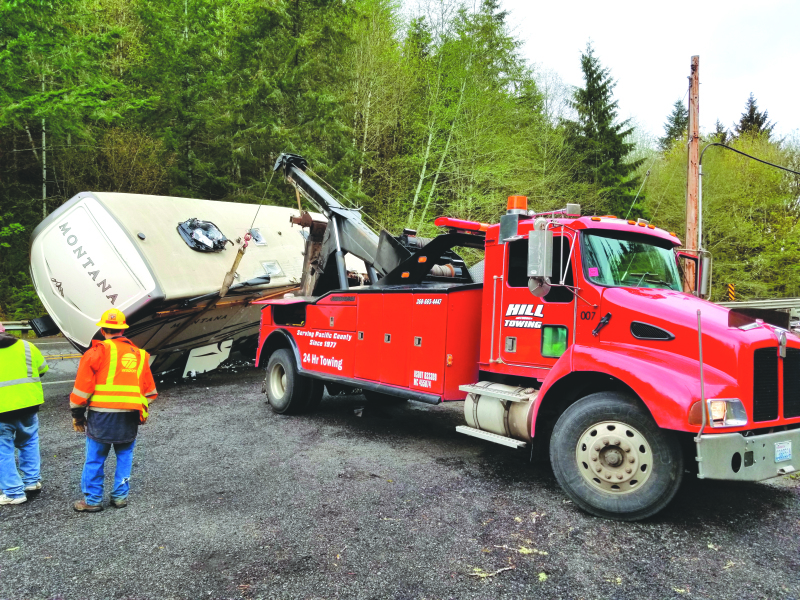 State Route 6 at the Pluvius Bridge was squeezed down to one lane for approximately 5 hours on Monday, April 22 after a fifth-wheel travel trailer tipped over onto its side blocking the westbound lane. 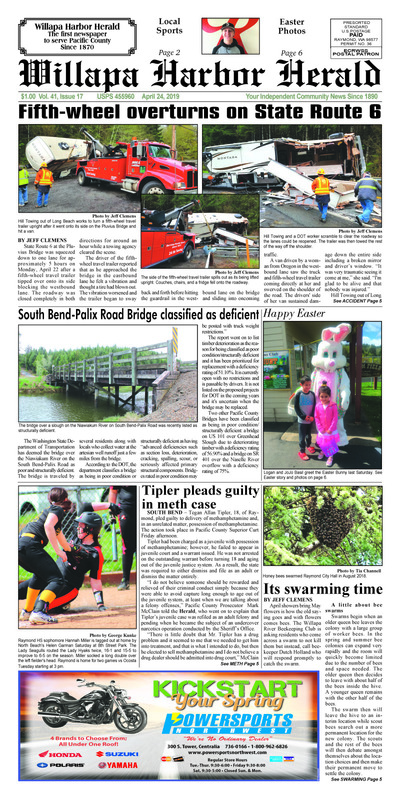 The Washington State Department of Transportation has deemed the bridge over the Niawiakum River on the South Bend-Palix Road as poor and structurally deficient. 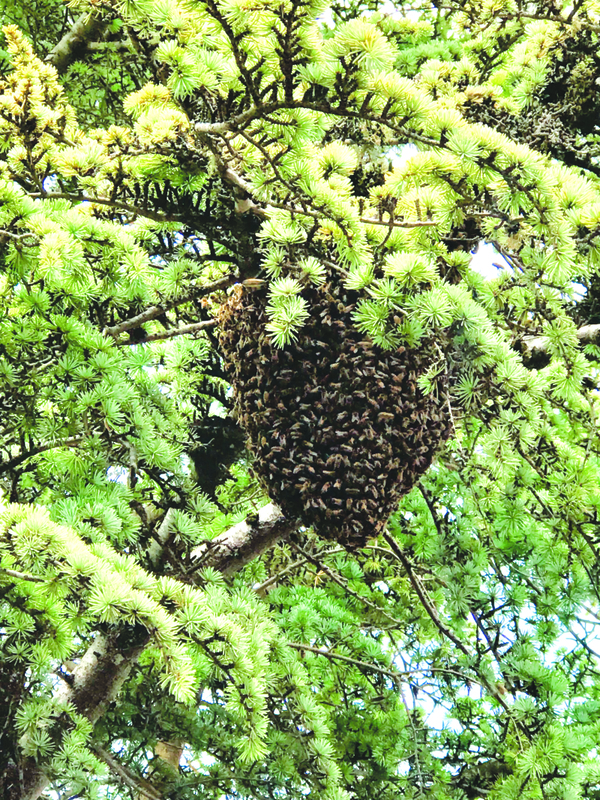 April showers bring May flowers is how the old saying goes and with flowers comes bees. 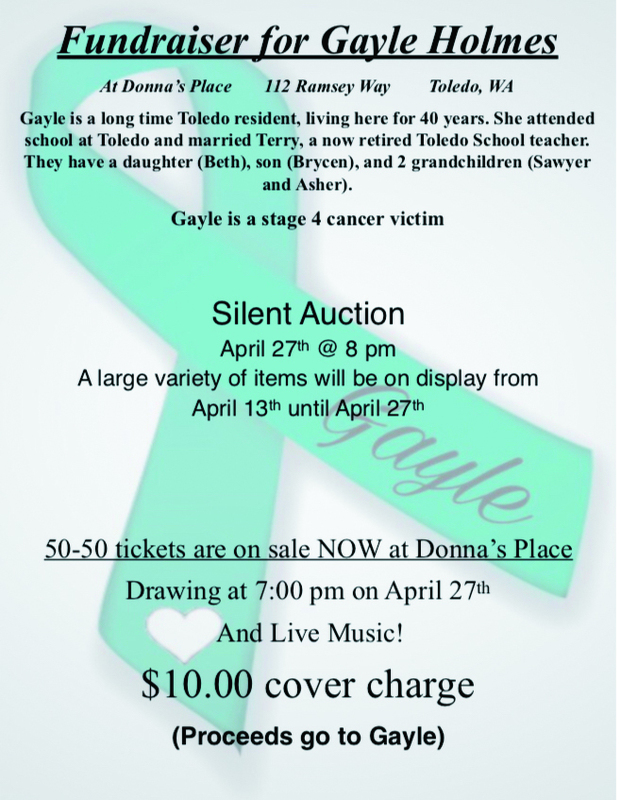 On Saturday, April 27, there will be a fundraiser at Donna's Place for Gayle Holmes. Gayle, a long time resident of Toledo, has been diagnosed with stage 4 Ovarian cancer. There will be a silent auction, 50/50 raffle and live music by Darken Side, Gayle and Terry's son. 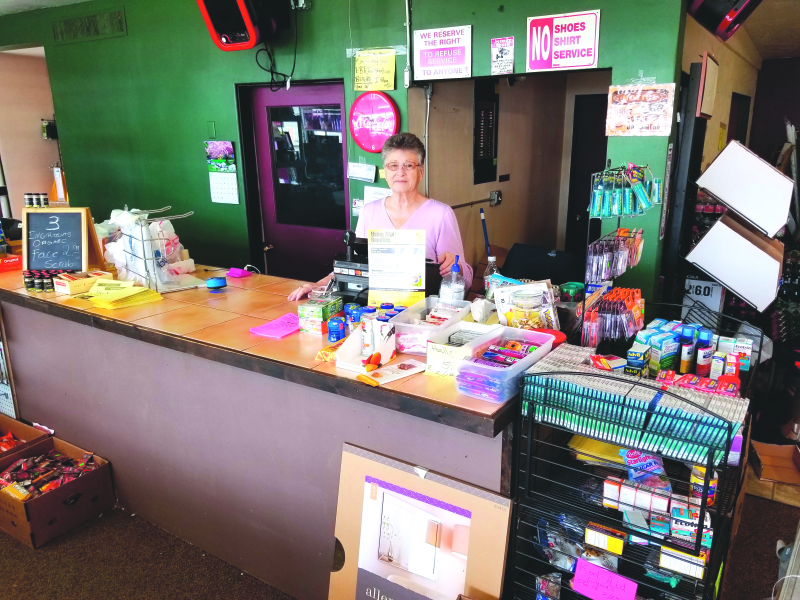 Gayle works at the dentist office in Winlock, and was diagnosed in January of 2019. She has continued to work during this time which is never easy to do. Gayle is married to Terry Holmes, who retired this past year from teaching. The Holmes family has been active in the community for many years and all who know them love them for their dedication. Donna Wallace, owner of Donna's Place stated, "This is a fundraiser that is near and dear to everyone who knows the Holmes family. The community has the opportunity to give back to the Holmes family after years of dedication to the kids in the community." 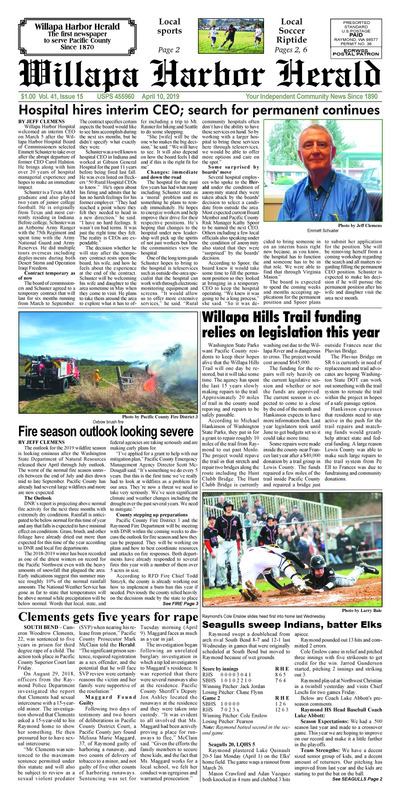 During the past, Winlock City Council meetings have had zero deliberations on important issues before them as required by the Open Public Meeting Act. 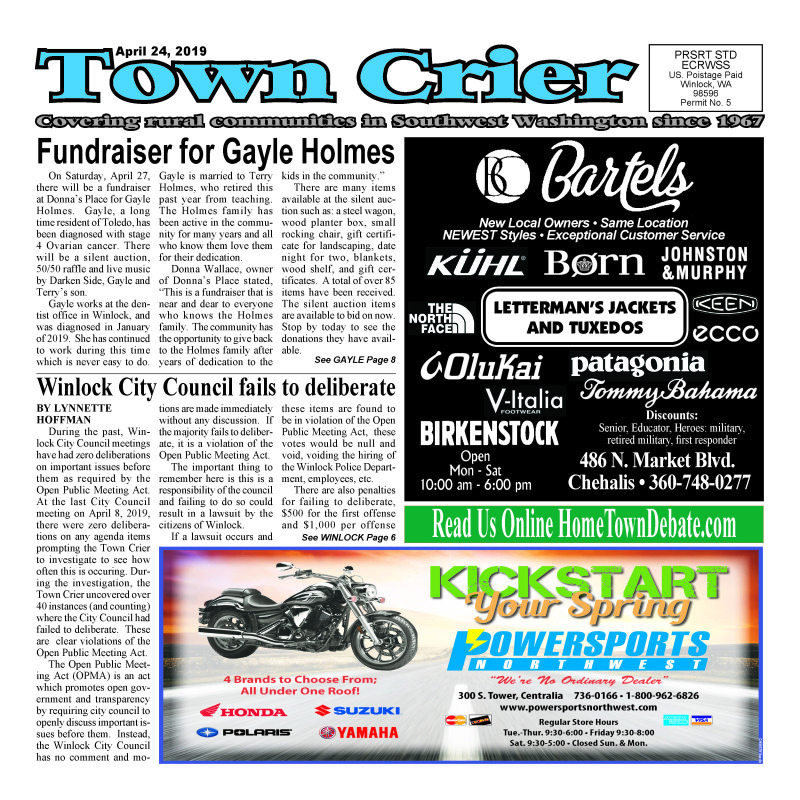 At the last City Council meeting on April 8, 2019, there were zero deliberations on any agenda items prompting the Town Crier to investigate to see how often this is occuring. 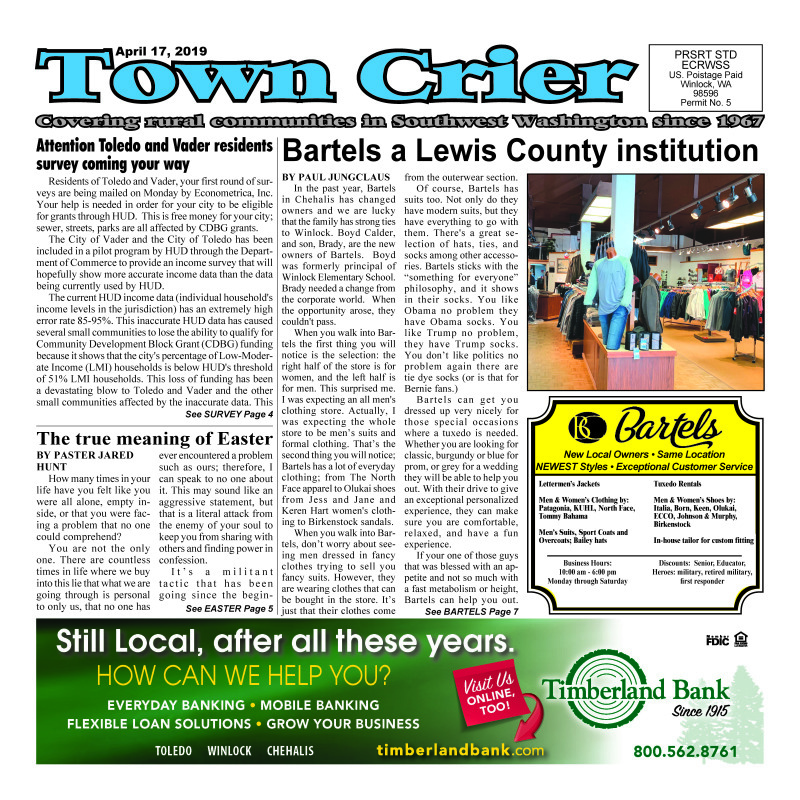 During the investigation, the Town Crier uncovered over 40 instances (and counting) where the City Council had failed to deliberate. These are clear violations of the Open Public Meeting Act. The Open Public Meeting Act (OPMA) is an act which promotes open government and transparency by requiring city council to openly discuss important issues before them. Instead, the Winlock City Council has no comment and motions are made immediately without any discussion. If the majority fails to deliberate, it is a violation of the Open Public Meeting Act. 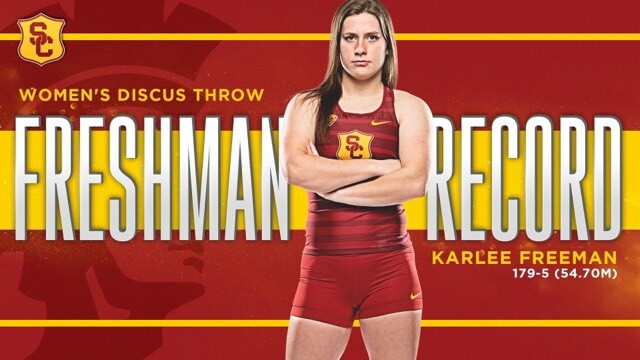 Former Raymond HS track and field superstar Karlee Freeman appears to be picking up right where she left off at Raymond...setting records! Raymond has a new liquidation store located in the downtown area and residents are enjoying amazing deals. The store has been open since last fall but wanted to get into the swing of things slowly. Now they want the word out they're open and they have great deals daily. Leaders of the Raymond and South Bend School districts have met recently to discuss upcoming Washington Interscholastic Activities Association (WIAA) rule changes and some of the challenges associated with declining turnout for football. The districts are considering having a "combine", or a "cooperative" high school football program, beginning in the 2020 season. The WIAA recently decided to allow districts bigger than the 2B classification to use their free and reduced lunch percentages to justify competing with smaller schools, potentially pitting 2B school districts (such as South Bend and Raymond) against much larger rivals. If the two districts request to play as a combine, they would remain much more competitive at the 2B level. How many times in your life have you felt like you were all alone, empty inside, or that you were facing a problem that no one could comprehend? You are not the only one. There are countless times in life where we buy into this lie that what we are going through is personal to only us, that no one has ever encountered a problem such as ours; therefore, I can speak to no one about it. This may sound like an aggressive statement, but that is a literal attack from the enemy of your soul to keep you from sharing with others and finding power in confession. Residents of Toledo and Vader, your first round of surveys are being mailed on Monday by Econometrica, Inc. Your help is needed in order for your city to be eligible for grants through HUD. This is free money for your city; sewer, streets, parks are all affected by CDBG grants. The City of Vader and the City of Toledo has been included in a pilot program by HUD through the Department of Commerce to provide an income survey that will hopefully show more accurate income data than the data being currently used by HUD. The current HUD income data (individual household's income levels in the jurisdiction) has an extremely high error rate 85-95%. This inaccurate HUD data has caused several small communities to lose the ability to qualify for Community Development Block Grant (CDBG) funding because it shows that the city's percentage of Low-Moderate Income (LMI) households is below HUD's threshold of 51% LMI households. This loss of funding has been a devastating blow to Toledo and Vader and the other small communities affected by the inaccurate data. The City of Napavine's Public Works Department will be chlorinating the City water reservoirs the week of April 15, 2019 through April 19, 2019. Please run water through your faucets for a few minutes before drinking. 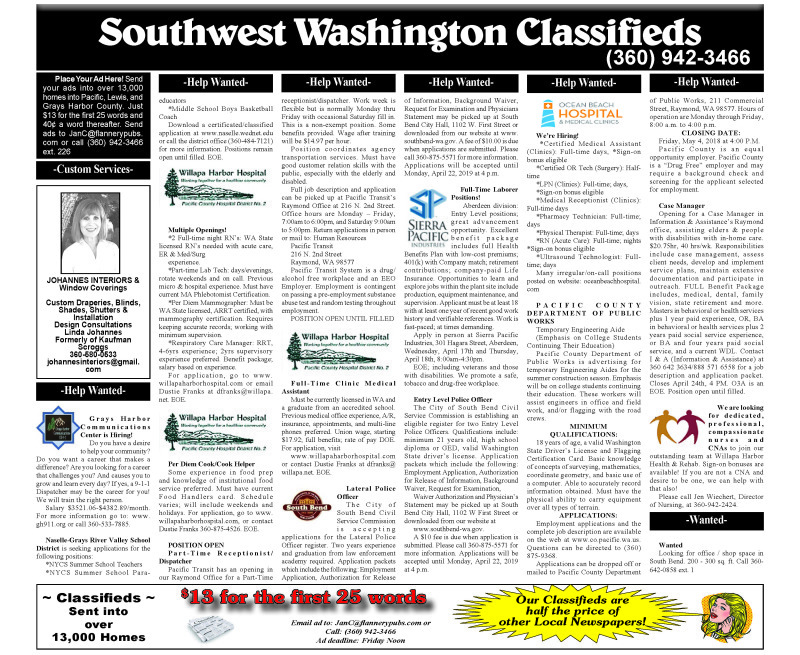 If you have any questions, please contact Public Works / Community Development Director Bryan Morris At 360-262-9344. 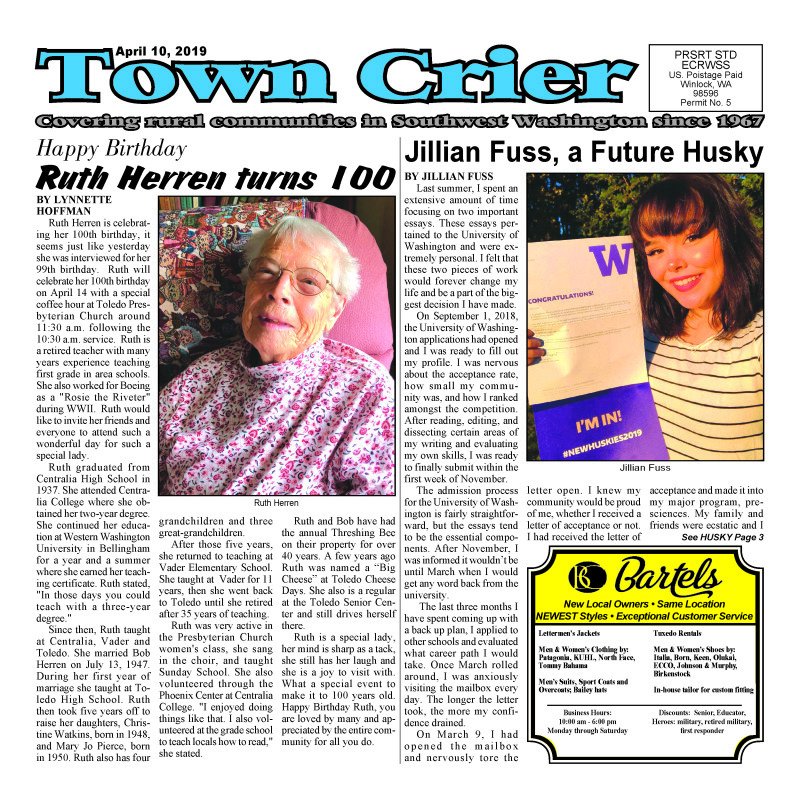 Ruth Herren is celebrating her 100th birthday, it seems just like yesterday she was interviewed for her 99th birthday. 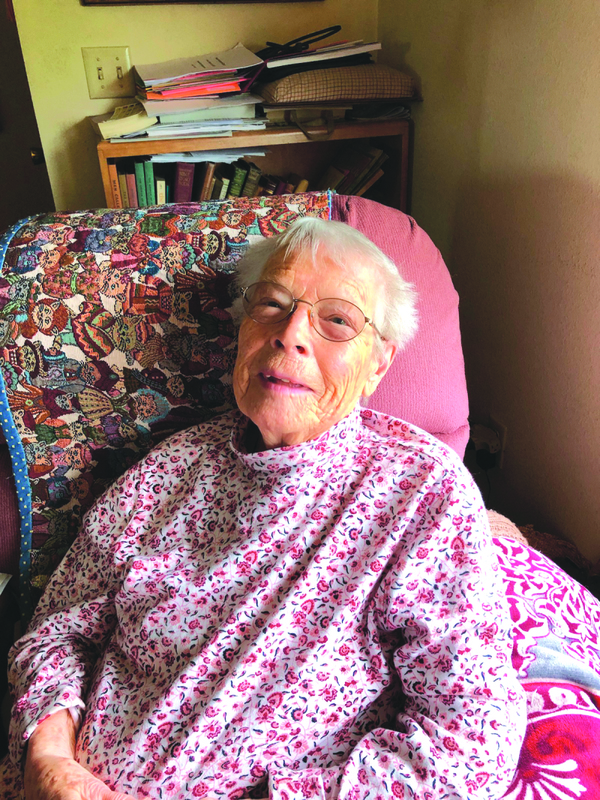 Ruth will celebrate her 100th birthday on April 14 with a special coffee hour at Toledo Presbyterian Church around 11:30 a.m. following the 10:30 a.m. service. Ruth is a retired teacher with many years experience teaching first grade in area schools. She also worked for Boeing as a "Rosie the Riveter" during WWII. Ruth would like to invite her friends and everyone to attend such a wonderful day for such a special lady. Last summer, I spent an extensive amount of time focusing on two important essays. These essays pertained to the University of Washington and were extremely personal. I felt that these two pieces of work would forever change my life and be a part of the biggest decision I have made. 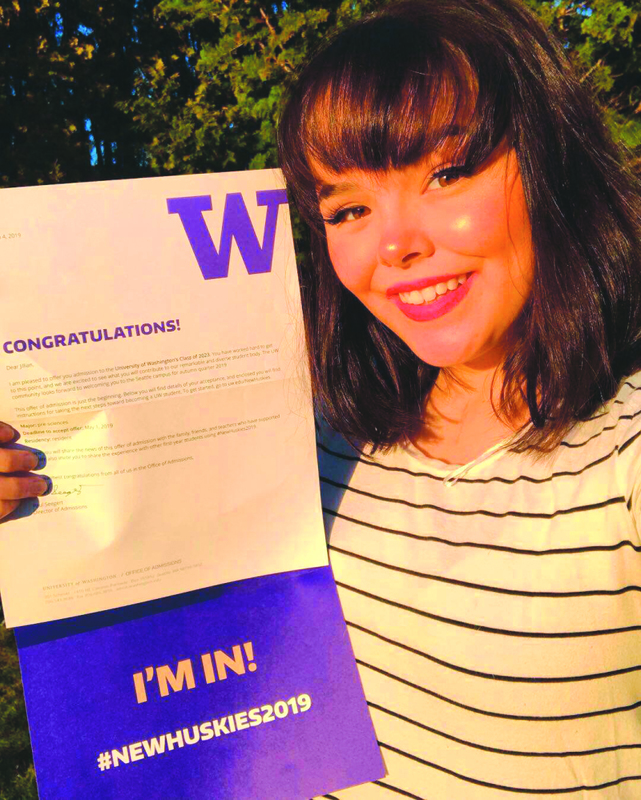 On September 1, 2018, the University of Washington applications had opened and I was ready to fill out my profile. I was nervous about the acceptance rate, how small my community was, and how I ranked amongst the competition. After reading, editing, and dissecting certain areas of my writing and evaluating my own skills, I was ready to finally submit within the first week of November. 49-year-old Shawn D. Clearwater of Raymond was killed in a fatal vehicle accident on SR 6 MP 7 on Sunday, March 31, 2019. 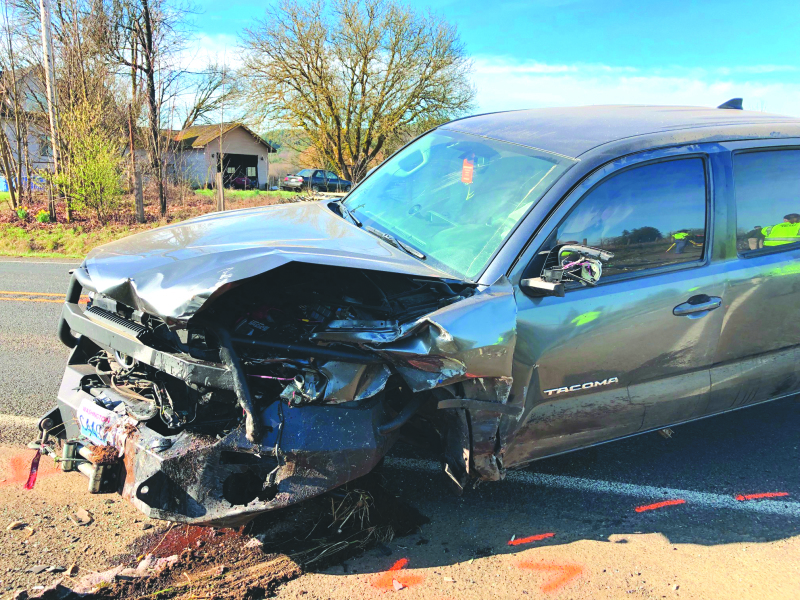 According to the preliminary crash report a 2016 Toyota Tundra driver by 38-year-old Mikey S. Pine of Chehalis was traveling eastbound on SR 6. The Tundra crossed the centerline into the westbound lane and struck a 1995 Mercury Cougar driven by Clearwater head on. 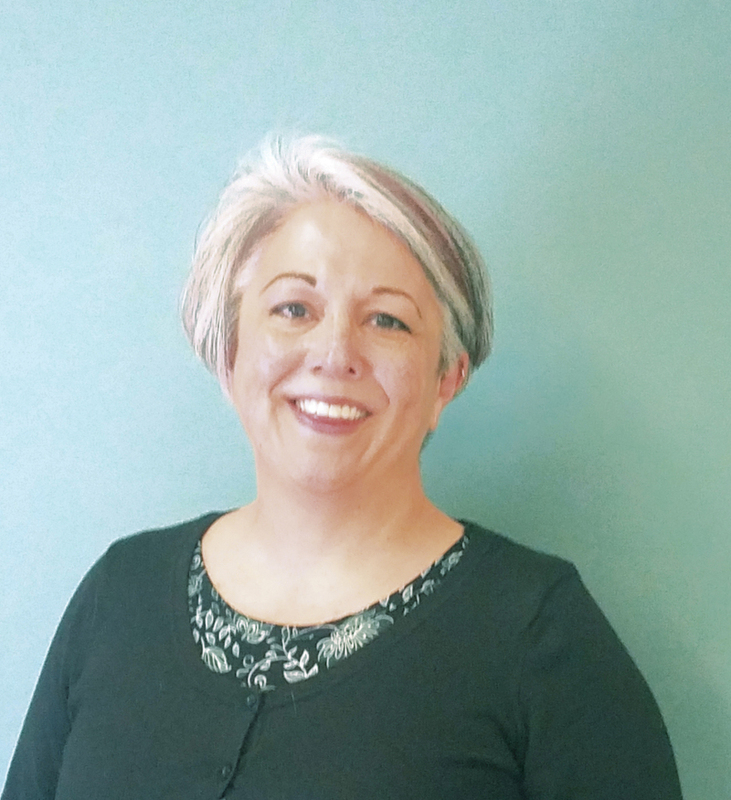 The Crisis Support Network in Raymond welcomed Julie Jewell as the new Executive Director on Monday, April 1. She brings along nearly a quarter century of experience to the position and hopes to make an immediate impact. She is originally from Pacific County and is excited to once again be a part of the community. Pacific County Sheriff's Office Chief Civil Deputy Matthew Padgett has been at the spear of another criminal investigation into his conduct. The Lewis County Sheriff's Office was asked to take over the case earlier this year to investigate harassment allegation complaints made by a Shoalwater Bay Police Department officer and an estranged former Raymond Police Department officer. 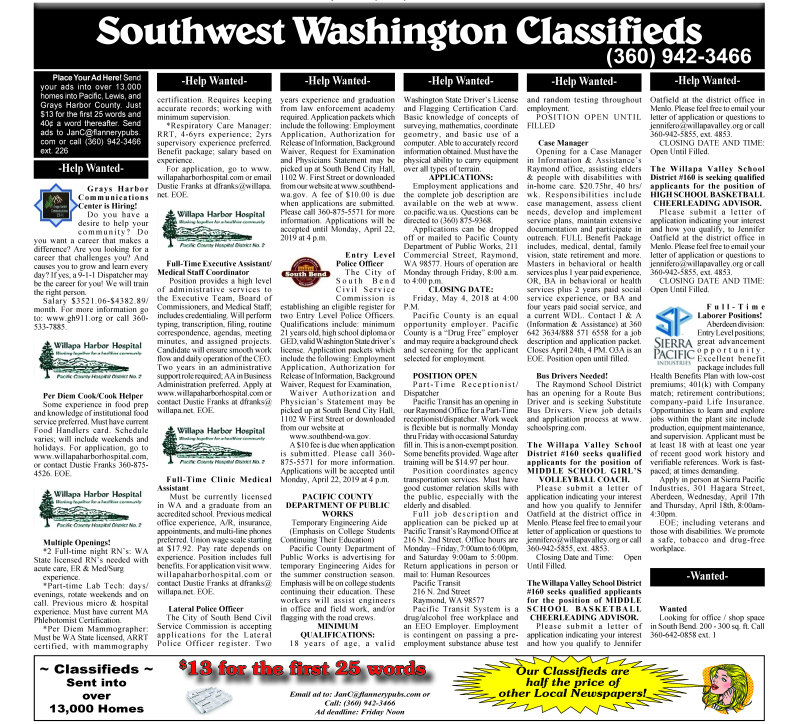 Both allegations came at the heels of the previous investigation by the Washington State Patrol and happened prior to him being appointed as PCSO Chief Civil Deputy.